Looking at the website of Nicoline van Stapele, I can see images, which are leading me back to the year 1987, to the first traces of her work. It is striking that during all these years, this artist has been working in a perfectly consequent way. Ever since her training at the KASK in Ghent, she has never stopped drawing, hundreds of drawings made in the course of these thirty years. Next to her drawings, she used rubber and many other materials to create objects and sculptures, including very imposing installations both in the open air and inside exhibition halls. VUB (Free University of Brussels) entrusted her with the artistic decoration of its nursery, where she realised a series of kidney shaped sculptures whose organic forms are child-friendly and can be used easily. In one of the conference rooms of ‘De Zebrastraat’, a cultural centre in Ghent, she realised a fascinating permanent installation entitled “Where Were We?”. She shows here her sense of humour and perspective. The actual exhibition, called ‘Not To Be Missed’, is a clear testimony of these qualities. Owing to limited space opportunities, Nicoline van Stapele shows here mainly drawings. Many of them are simple, geometrical patterns. The foundation of every drawing is a point and a line. Many of her works demonstrate how these two pillars of the art of drawing can be repeated indefinitely and still remain different. They create a fascinating rhythmic image and can evolve into a series of intriguing patterns, producing both movement and quietness in the minds of those observing them. They show how a grid pattern of crossing lines can produce a suggestion of space, profoundness and mystery. Consequently, we can say that the drawings of Nicoline contain a strong dose of poetry, more precisely the poetry of everyday life as we find it in the poem ‘Marc greets the things in the morning’ by Van Ostaijen. Nicoline van Stapele loves hiking in the company of her dog Tinto, which according to Nicoline, ‘conducts an in depth inquiry into grasses and trees’. As does her dog, Nicoline never fails to observe her surroundings. One way or another, these observations reappear in her drawings, be it in a very abstracted way, as a kind of translation. In this sense, the series called ‘I’ll Keep This Short’ exhibited here, is in fact a display of conversations. As in recordings, you discover a kind of modulation bar, a line full of variety rendering the pitch and, on the other hand, one or many square coloured blocks rendering the timbre. Some “conversations” were very short, others are clearly longer or involving more participants. But this way you see that a simple observation can form the starting point of a surprising series. This series was created on the occasion of an exhibition in Hasselt in 2016. The name of this exhibition derives from a smaller series of drawings, executed in 2014. If you take a closer look at those drawings, you will every time discover the same phrase. These works were drawn with a small pipette branded ‘Sennelier’. Coincidence and irregularities are playing a role in the shaping of lines and are part of the charm of the drawing. Nicoline prefers to work with this ink or other ones which are colourfast, in contrast to ecoline. The title ‘Not To Be Missed’ was a mantra the artist heard over and over again in the Cologne Fine Art and the direct motive for the creation of these drawings. You can discover in these a kind of street-plan with bright coloured areas not to be missed. But of course, these works are more than that. The point is your own personal exploration, your personal appreciation and it is not about what the silent majority says you should appreciate or think. Nowadays Nicoline is staying in the Cité internationale des arts in Paris. Belgium and the Flemish Community have a residence there, offering many artists the exceptional opportunity to work in a concentrated way, within the context of a cosmopolitan artistic community. In Paris, Nicoline took the opportunity to paint on a larger format than she is able to in her own atelier in Ghent. An empty atelier can become a great source of inspiration. Her long walks in the city of Paris, be it without Tinto, are leading to a fascinating series of paintings called ‘Many Bridges To Cross’. They are also abstract works originating from specific experiences and observations, translated into geometric elements and signs. I hope we will soon have the opportunity to admire these works. Ladies and gentlemen, I hope this brief introduction can help you to approach and appreciate the remarkably integer work of Nicoline, most certainly an artist who deserves your full attention. The urge to collect runs in the blood. It’s probably still a genetic remnant from the time it was still of vital importance. Nicoline van Stapele meets our urge to collect: she makes collections. She creates forms which belong to each other, in one way or another. She combines forms which interact with each other or which reject each other and by doing this, she makes compositions and installations. The forms are often derived from nature while her drawings and collages clearly tend to be geometric. She is occupied with space, both in a two-dimensional as in a three-dimensional way. It’s the surrounding space, which determines how a collection shall be shown. Her works of art are in this way never finished. “Works which are in my neighbourhood, are always subject to change.” she says. Nicoline van Stapele graduated in sculpturing at the academy of Ghent in 1987. Afterwards she studied restoration and got her degree in 1989. The job as a restorer admitted her to survive and create plastic works of art in all freedom, without the need to make concessions. When she couldn’t find an atelier, she created rubber wall tapestry. Simple, sober material, which didn’t take much space at home but which, once installed, had a great spatial impact. This attitude shows her intelligent and subtle way of dealing with limitations. As Goethe already said: “In der Beschränkung zeigt sich erst der Meister”. Later she taught at the sculpturing class of the local academy of Ostend. Her aim was to teach her students to look at the forms in nature. For that purpose, she brought a collection of succulents, bones and vertebras to the class. This was more a source of inspiration, for herself than for her students. What attracts her the most are branches. Although she doesn’t think of herself to have a green thumb at all, she’s still fascinated by trees, especially by their branches. She finds it very interesting to manipulate forms with other textures and in this manner creates completely new forms and structures. She is really a hard worker and has a high level of concentration, which is also of vital importance for her job as a restorer. Her portfolio shows a continual and consequent evolution. Her many drawings and collages, in which she tries out various combinations, demonstrate a steadiness which commands admiration. The lover of art can taste the almost indefinite amount of possibilities which the artist explores. Her wall-installation, which was bought by the province Oost-Vlaanderen, proves that she knows how to deal with space. Originally this piece consisted of eleven elements. It was meant to be installed on a wall of the provincial administrative centre ‘Het Zuid”. 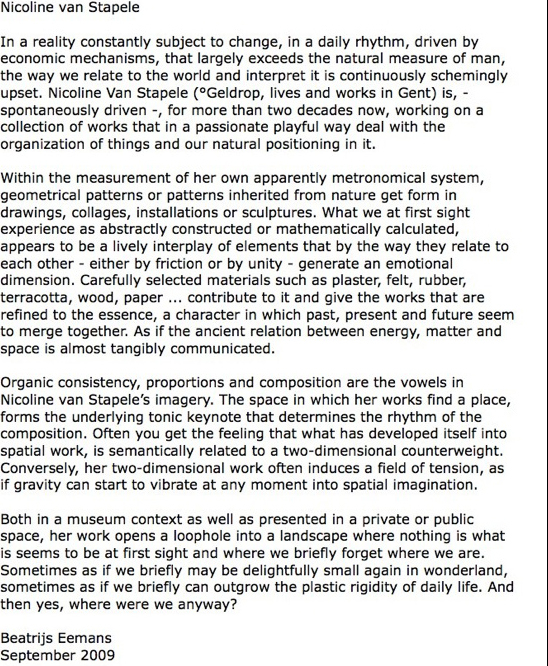 That’s the reason why she created eleven more elements for this work; it now consists of twenty-two elements. In this manner, the piece preserves its original meaning and impact. It seems to me characteristic of her consequent attitude and her scrupulous way of sensing and interpreting a certain space. An installation isn’t confined to certain boundaries but should interact with the surroundings. The size and amount of elements of an installation is by definition variable. Rubber, plaster, terracotta and synthetics are frequently used materials in her work. For a day nursery of the Vrije Universiteit van Brussel she created a series of inflatable, kidneyshaped sculptures . These objects are not merely an artistic message for passerbyers but they are also ideal toys for children in which they can nestle. She therefore received this commission rightly as the winner of the competition. The shape of a kidney is something which often returns in her creations and it is the shape which more than anyother refers to the organic. It is also a form with art-historical references. It reminds us of Jean Arp, Joan Miró, Yves Tanguy, Salvador Dalí and other surrealists. It’s a friendly shape, which she places in contrast with harder, more geometric forms, whether in other materials or not. It’s a playful shape, which we can find back in nature. She once made a series of kidney-shaped, manageable objects, as a sort of multiple. When you manipulate the object, it makes a kind of bleating noise, “the voice of the artist”, she says ironically. The work of Nicoline van Stapele is intriguing and of a moving simplicity. It invites us to participate, even to touch. I can easily imagine that the owner of one of her collections, secretly or not, frequently or not, plays with the collection and creates with it, in any case he dreams away when he is near it and he gives free course to his imagination. And isn’t this one of the very missions of the artist?